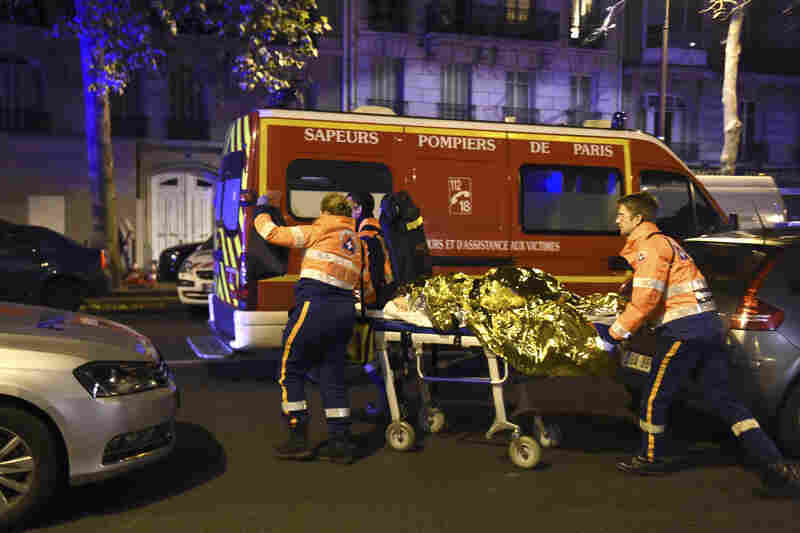 French Authorities Say The Death Toll In Paris Attacks Could Exceed 120 : The Two-Way The French capital was rocked by shootings and an explosion in six locations on Friday. French police stormed and took control of one location. At least five attackers have been killed. 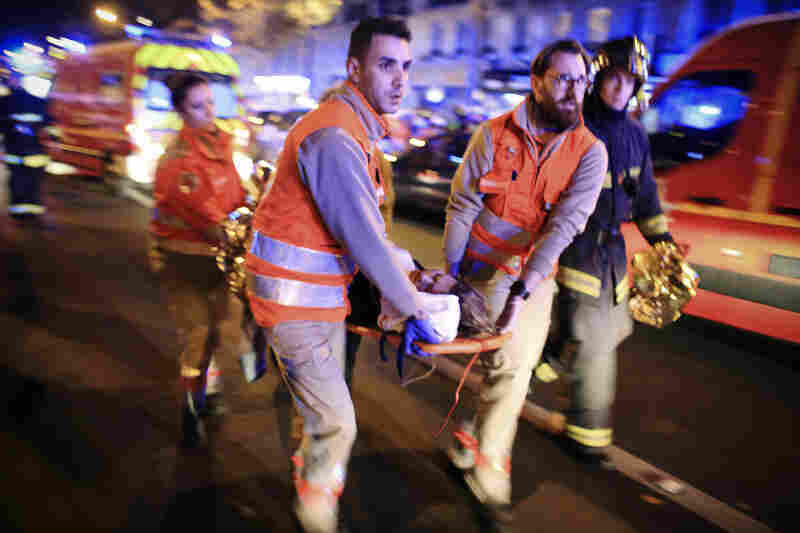 Rescue workers evacuate an injured person on Boulevard des Filles du Calvaire, near the Bataclan. 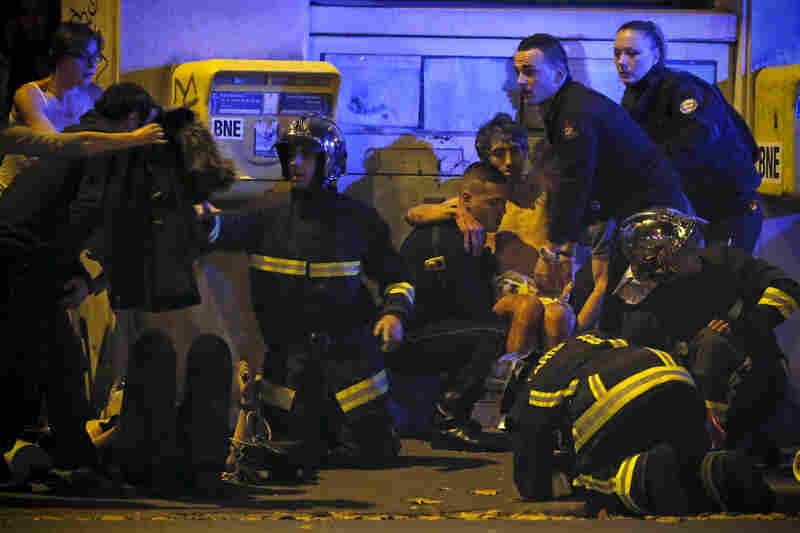 An injured man holds his head as people gather near the Bataclan. 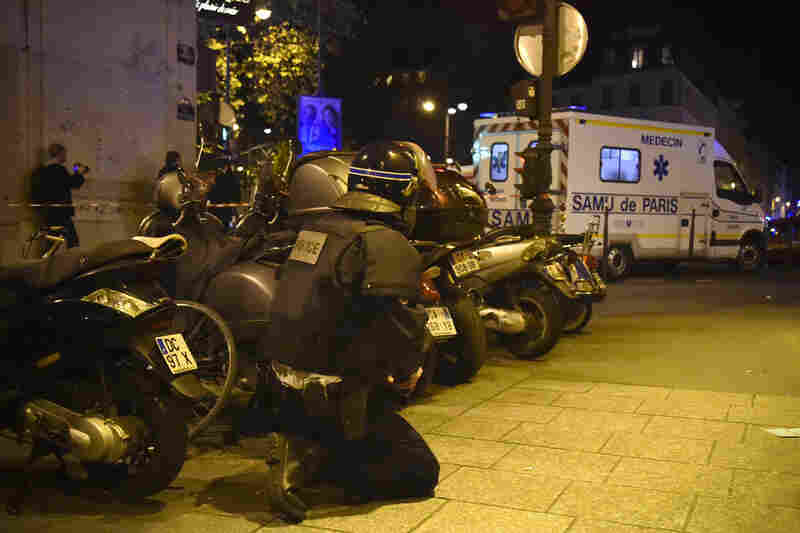 At least three sites were attacked — a restaurant, the Bataclan and a site near a major stadium. Law enforcement officers gather outside the Bataclan, where people inside were being held hostage. NPR's Eleanor Beardsley says that French police have reportedly taken control of the concert hall and two attackers have been killed. People wearing survival blankets walk by a rescuer near the Bataclan concert hall in central Paris. A French police official is quoted by the Associated Press as saying at least 100 people were killed inside the concert hall. 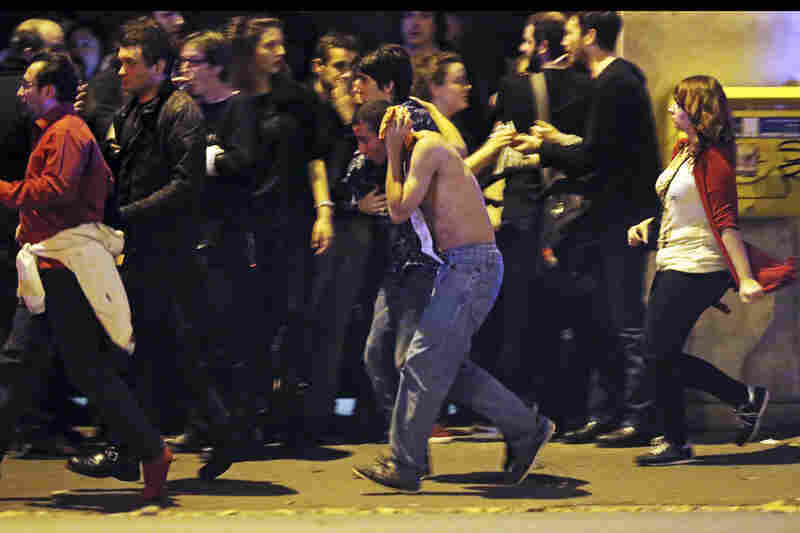 French fire brigade members aid an injured individual near the Bataclan following the shootings. 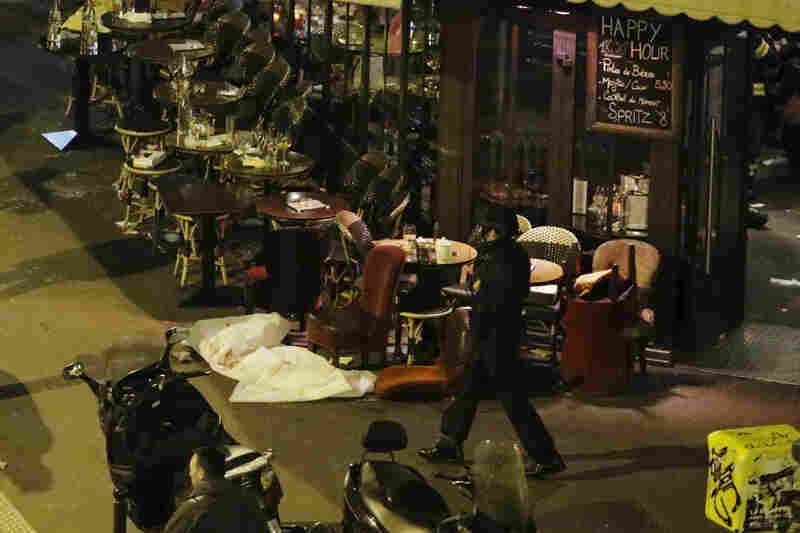 A white sheet covers a victim on the ground outside a restaurant in central Paris. 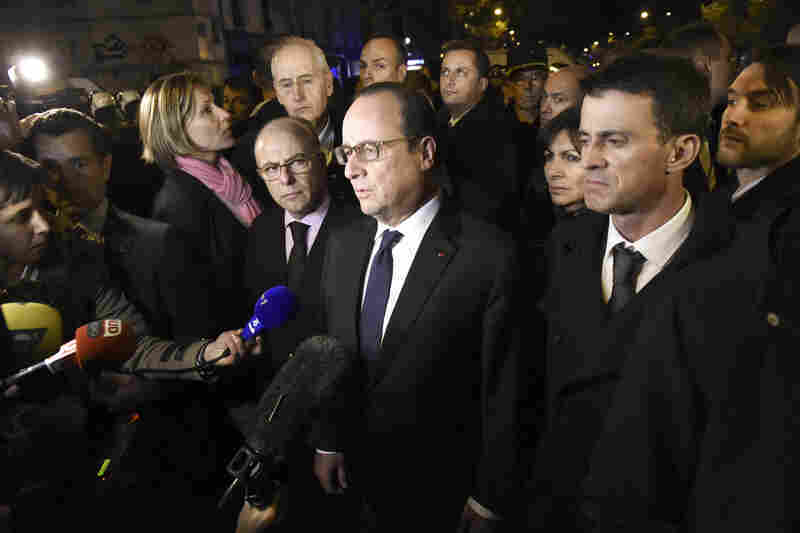 French President Francois Hollande (center), flanked by French Interior Minister Bernard Cazeneuve (left) and French Prime Minister Manuel Valls (right), addresses reporters near the Bataclan. A riot police officer stands by an ambulance near the Bataclan. 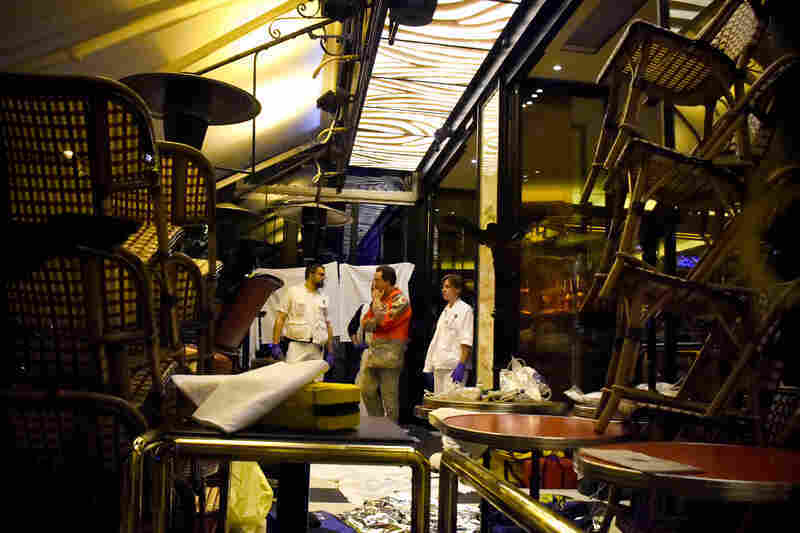 Rescuers stand in a restaurant following an attack in central Paris. Police vehicles are seen at the Place de la Republique square near an attack site in central Paris. 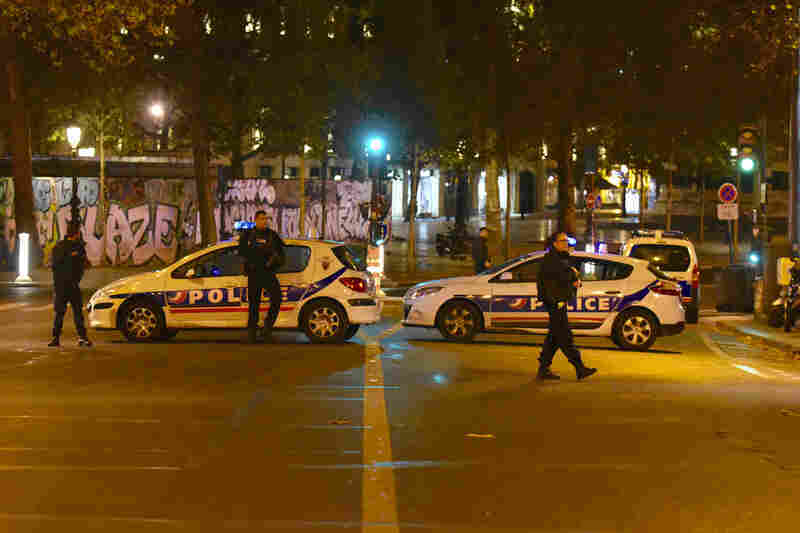 Paris prosecutor Francois Molins says there have been six attacks in and around the city, and the death toll could exceed 120. The majority of those killed were in a concert hall. NPR's Eleanor Beardsley reports that French police stormed and took control of a concert hall, and two attackers there were killed. Molins says at least five attackers in total have been killed. The hall is one of six locations that were the target of nearly simultaneous shootings or bombings Friday in the French capital. Most appeared to be within a one-mile strip in the center of the city. 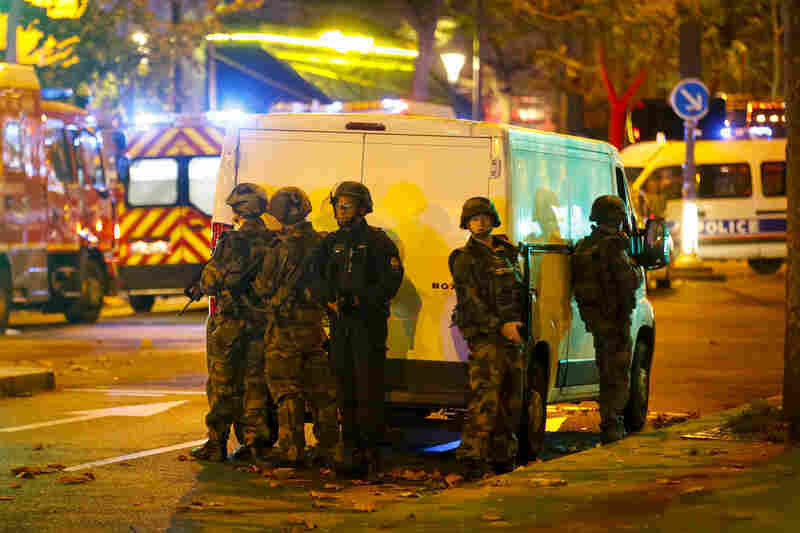 The concert hall that was attacked, called the Bataclan, was secured by police. Officers described the the inside of the building as a "horror scene." The band playing there was American rock band Eagles of Death Metal. The band's manager released the following statement: "We are still currently trying to determine the safety and whereabouts of all our band and crew. Our thoughts are with all of the people involved in this tragic situation." Eleanor reported that another attack involved two suicide bombings near the national stadium, just outside the city, where a soccer game between Germany and France was being played. NPR's Dina Temple-Raston says law enforcement officials believe the "suicide bombers outside the stadium were likely planning to go inside but changed their minds because of the heightened security that accompanied French President Francois Hollande, who was there to watch a soccer match." "People are saying that Paris is under attack again," Eleanor said, referring to the terrorist attack on Charlie Hebdo that shook Paris in January. Dina reports that officials in both the U.S. and France say "the sophistication of the attacks give them some clues as to who committed them, although no group has formally claimed responsibility. The officials' suspicions, at this early stage, point to al-Qaida because the group specializes in these kinds of attacks. ISIS, to date, has not shown that level of organization." Hollande addressed the nation, announcing that he had declared a state of emergency and had put additional restrictions on France's international borders. Dina reported that France was quick to secure the borders in order to prevent the escape of any suspects, as happened after the Charlie Hebdo attacks. One of the suspects who French police searched for in the wake of January's attacks on the publication Charlie Hebdo and other sites was the wife of the man who opened fire in a kosher supermarket; she was his common-law wife, and as they looked for her, she disappeared. Dina says the woman had sneaked across the border with Turkey, and Hollande may have wanted to avoid a repeat of that kind of situation in closing the borders so quickly. In Paris, Eleanor says the city is in complete lockdown. She said French TV got its earliest information from people on the scene. "Many people were crying and the news channels had to cut them off because they couldn't have that kind of thing on the air to panic people because nobody really knows what's going on." He spoke with Hollande by phone later Friday night, to "offer the condolences of the American people" and to reiterate "the United States' steadfast, unwavering support for the people of France, our oldest ally and friend," a White House spokesman said in a statement. The U.S. men's national soccer team showed its respect for the victims by holding a moment of silence before its game against St. Vincent and the Grenadines. Other venues and landmarks around the world also expressed support for France.